We were anticipating something good after a mixed up qualifying due to rain. However, the clouds stayed away today leaving us with a more traditional Hungarian Grand Prix. There were some strategy calls to watch out for, and plenty of tense fighting, but overtaking is notoriously difficult so the results were more down to luck and keeping your head down than anything else. Nevertheless, if you want to relive any of the action, or want a quick reminder of how it all went down in Hungary, read on for coverage of every single lap of the race. Hi Factbyte Factbox friends, it's Sunday which means race day. Are you ready for Hungary? Despite the chaos on Saturday, it's still a Mercedes front row with Nico Rosberg ahead of Lewis Hamilton. Their race starts have caused plenty of kerfuffle so far this season, so that's definitely something to watch when the lights go out. The Hungaroring has been resurfaced this year, and drivers have the middle of the road compounds to play with. There's about half an hour to go until the race begins, so the pit lane has opened and cars are heading towards the grid. Williams squeezed into the top ten with Valtteri Bottas, but unfortunately Felipe Massa was out early in Q1 after crashing into the wall. He caused one of three red flag periods during that first session. Meanwhile, McLaren did a great job to get both their cars into the top ten, and Fernando Alonso is hoping they can capitalise today. "It’s been a good weekend so far. P7 every single session. At the moment the car seems to perform well at this circuit, we have to capitalise this weekend and hopefully score some good points today. I think there’s a real chance we can improve our best result, we need some help… people at the front have any issue, any problem, we will be ready to take the opportunity." Felipe Massa completed an installation lap, but the Williams has returned to the garage and been pushed back in to a sea of mechanics poring over the car. Could be a problem there. Tweet from @pirellisport: Dry conditions, so we're expecting a two-stop race. It makes little difference to overall race time whether you start on soft or supersoft. Daniel Ricciardo on the grid: "Feel good, very good. Pretty relaxed, pretty calm. I think if we can get a nice tow off the Mercedes into turn one, it should put us pretty close in the braking zone. I’m hoping there’s going to be a good fight today." Max Verstappen on the grid: "You could see in GP2, already some people on the right side had a good start. We’ll see. Hopefully we can do a good start and from there on we can challenge the guys ahead. Maybe with some pit stop changes we can jump them, but I think the most important thing is to get a good start." Felipe Massa had just a couple of minutes left to exit the pit lane before it closes but he's managed to get out - it looks like it was some kind of steering issue but they hope they've fixed it! 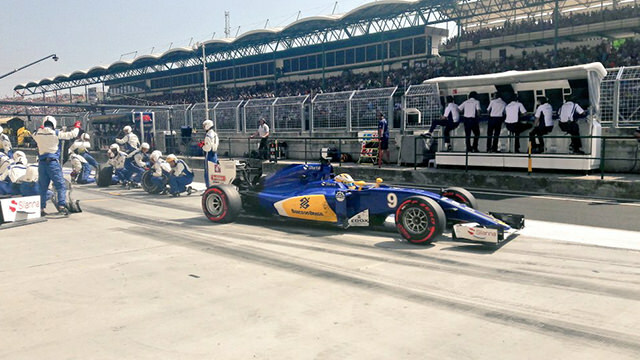 Marcus Ericsson is starting from the pit lane, after crashing during qualifying yesterday. They've had to patch up that chassis considerably, so he'll be at the pit lane exit when the race gets underway. It's the second race in a row he's had to start from the pit lane, too. Williams have added that Massa is still feeling a problem with the steering on the car, but it's okay to drive, at least to start the race. This could be a tense race, there's just one championship point between Rosberg and Hamilton. The momentum had been leaning Lewis' way, but the luck in qualifying was firmly with Nico. Tweet from @pirellisport: The risk of rain is 10%. Interestingly, that’s exactly the same percentage as was quoted shortly before the monsoon-like deluge yesterday. The formation lap is underway, with Rosberg lead the pack away in the steaming hot conditions. The top ten are all on the supersofts, after their Q2 performance. Grosjean in 11th is also on the supersofts. Soft tyre selections come from Kvyat, Pérez and Räikkönen, in 12th, 13th and 14th respectively. Also, Palmer and Massa, and Haryanto and Ericsoon, all a bit further back. Rosberg pulls to a halt in his pit box, as Hamilton backs the pack up behind him. Both the Mercedes made a good start, but they were swamped by the Red Bull drivers at the first corner. Ricciardo took the outside line but ended up second. Hamilton has got up to first. Into turn two, Rosberg went round the outside of Ricciardo and got back ahead but he's second now. Fernando Alonso gained a position off the line, passing Carlos Sainz to move up to sixth at this early stage. Kimi Räikkönen is coming under pressure from, huh, a Sauber and a Renault. As the second lap gets underway, Kimi has moved ahead of that squabbling pack. We've got Nasr being chased by Palmer and Wehrlein is looking to keep tabs on the battle as well. Tweet from @ForceIndiaF1: End of lap 1 - Nico in P10 tracking BOT, Checo in P13 behind two Haas. GUT ahead for a Mexican derby! Daniil Kvyat has lost eight places at this early stage in the race. He got a slow start off the line, and lost most of those places before he'd got to turn one. He's down to 20th. Jenson Button has slowed right down, he's been passed by three cars down the main straight. Team radio from Jenson Button: "Pedal's going to the floor, what's the problem?" No pace on that McLaren at all. Team radio to Jenson Button: "Do not shift, do not shift, we've lost hydraulic pressure." Team radio to Jenson Button: "Jenson, stay out, stay out." "Oh fantastic. The race from hell, this is going to be." Button is now last, and way off the pace of everyone. Rosberg is keeping tabs on the race leader, within two seconds of Hamilton out front. Jenson Button comes into the pit lane, and heads back out again. Incident involving Jenson Button under investigation - unauthorised radio communications. Team radio to Max Verstappen: "You're still within DRS of Ricciardo." "I'm driving like a grandma." Meanwhile, Kimi locks up a little as he continues to hunt down the Haas ahead of him. Even DRS isn't helping the Ferrari make a move yet. Drive through penalty for Jenson Button - unauthorised radio communications. Hamilton is busy setting the fastest lap of the race so far, early days though. It's a 1:25.674. Jenson Button comes into the pit lane to take his drive through penalty. He was right, this is the race from hell for him. 13 laps in and Grosjean has still got a Ferrari in his wing mirrors. They're on different tyres so perhaps on different strategies, but I would have expected Kimi to make a move by now. Team radio from Jenson Button: "So, the brake pedal going to the floor isn't classed as a safety issue? That's quite interesting. I think someone needs to read up on what is safe and what isn't." Sebastian Vettel dives into the pit lane for his first stop of the day, and it kicks off the pit window. Hülkenberg and Grosjean both come in as well. Vettel rejoins right in front of teammate Kimi Räikkönen, and the pair are now on the same tyre compounds - Kimi's 14 laps older. Tweet from @pirellisport: Vettel in and onto the soft tyre; trying to beat the Red Bulls on pace. Can he get past them once they make their stops? The Red Bull mechanics appear in the pit lane and it is Daniel Ricciardo that gets the call first. Soft tyres go on the car and he rejoins comfortably ahead of the Ferrari pair. Lewis Hamilton comes into the pit lane, and Max Verstappen takes his turn for a Red Bull stop. Verstappen has rejoined in between the two Ferraris, and with the momentum Räikkönen gets past the Red Bull. Max has lost out for now, but he's ready to take the fight to Kimi. Nico Rosberg briefly led the race there, but comes into the pit lane for his own stop of the day. He rejoins easily in second place, giving the lead back to Hamilton. Meanwhile, Daniel Ricciardo sets the fastest lap of the race so far - 1:25.433. The entire field are on soft tyres now except for Kevin Magnussen in ninth place, who is still running the supersofts he started on. Verstappen closes up to the Ferrari but doesn't have the pace to take the outside line just yet. Hamilton is complaining about his drinks, he sounds completely relaxed out front if annoyed that he's running out of liquid. Those who haven't stopped yet include Kimi, up in fifth, Pérez, Palmer and Magnussen also tucked into the top ten. Massa and Kvyat down in 13th and 14th, as well as Rio Haryanto further back. Rosberg is within DRS range of Hamilton at the moment, but he's not close enough on this lap. Jenson Button has made up a position on Marcus Ericsson, now running around in 21st place. Which begs the question, what's up with Ericsson!? Kevin Magnussen is still circling on those supersoft tyres, 22 laps now. Tweet from @pirellisport: We’re seeing track temperatures now that are as hot as the highest levels we’ve seen so far this year (in Baku). Kevin Magnussen finally comes into the pit lane, a solid 23 laps on those supersofts. Good job, KMag. Daniil Kvyat has also popped into the pit lane for his first stop of the afternoon. Magnussen's late pit stop made us think he was heading for a one-stop, but he's bolted on another set of supersofts. Interesting strategy from Renault. Felipe Massa, meanwhile, has put on the medium tyres, the first sighting of white stripes this afternoon. Incident involving Daniil Kvyat under investigation - speeding in the pit lane. Tweet from @pirellisport: Looks like @MassaFelipe19 is trying a one-stop strategy by going for the medium. Will be interesting to see how that works out. A first pit stop for Sergio Pérez, who drops a few places but rejoins in tenth position. 5 second time penalty for Daniil Kvyat - speeding in the pit lane. Only two drivers have yet to stop - Kimi Räikkönen up in fifth place, and Rio Haryanto down in 17th. Jenson Button heads back into the pit lane, another stop for the McLaren. Kimi Räikkönen finally comes into the pit lane, after almost half the race. He's got supersofts going on. Räikkönen, on his fresh rubber, drives around Alonso and disappears into the distance. Alonso's tyres are 15 laps old, and he has to settle back into 7th place. "Okay Lewis, Ricciardo's about to get on the back of the train, so we need to open this gap up." "I'm driving to the best of my ability with these tyres." "If these cars bunch up, we'll be bringing Nico in first." "Why would they do that? It's not like I'm driving slow, I'm trying." "Yea, Lewis, it's just the risk is we're putting the win in jeopardy." Rosberg got held up in traffic there, though, so he's probably not in line to be brought in first now. The gap between the Mercedes is 2.5 seconds. Ricciardo still closing in. Ricciardo has jumped first and pitted for the second time, he's got soft tyres on the Red Bull again. Wehrlein pits for the second time, as Ericsson and Massa do battle for 19th place. Grosjean and Magnussen take their turn in the pit lanes, following each other in and out without a change in the order. Verstappen has had one warning of being off track limits. They're allowed three before harsher penalties kick in. The Red Bull driver dives into the pit lane for his second stop, he was fourth, and he rejoins in sixth place. Jolyon Palmer follows Nico Hülkenberg around the track, and then into the pit lane as well, but Renault put in a stellar stop and get their driver out ahead of the Force India. Tweet from @ForceIndiaF1: Oh bugger. Lewis Hamilton takes a wide line into the pit lane but does jink inside the white lines and head in for his second stop. Another beautiful stop by Mercedes and they release their driver as Sebastian Vettel heads in for his own quick turnaround. Once again, Rosberg was given one lap to lead the race and then he comes in for his own pit stop. Hamilton sweeps past the pit exit and Rosberg rejoins in second place. Replays show Sergio Pérez came into the pit lane and the team weren't ready for his pit stop, they had to hustle to get new tyres on and send him on his way. Sebastian Vettel has been complaining about blue flags for quite a few laps now. "I mean, come on, seriously," he moans over the radio. Kvyat has come into the pit lane, and taken his five second penalty before being sent on his way. Max Verstappen looks like he's exceeded the track limits for a second time now. 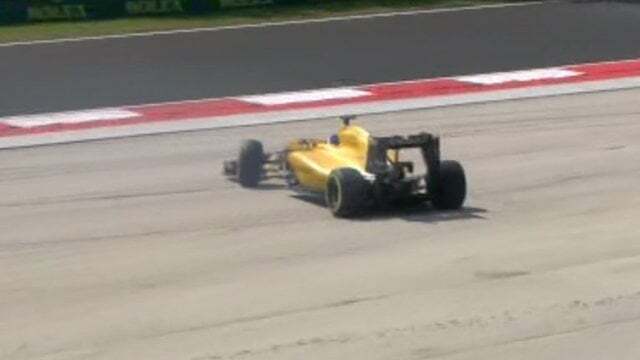 Jolyon Palmer has a high speed spin off at turn four, but he points the car in the right direction and gets going again. He's down to 13th now, after all that amazing pit stop work by the team. Snapshot of Jolyon Palmer losing control briefly. When Verstappen was told about his track limits issue, he said: "Yea, I know, I ran wide, and lost a lot of time." Kimi Räikkönen comes into the pit lane, another set of supersoft tyres go on the car, and he rejoins in sixth place. He's got clear track but will be aiming to take on Verstappen. Black and white flag for Fernando Alonso - track limits! Marcus Ericsson started from the pit lane, and has been back in there twice so far. Incident involving Esteban Gutiérrez under investigation - ignoring blue flags. "Fernando, we've had a final warning for track limits." "We are at two, or three?" Gutiérrez was holding Lewis Hamilton up during that blue flag situation, which allowed Nico Rosberg to close to around about one second of the race leader. Räikkönen has closed up to Max Verstappen, as we anticipated, so we're in for yet another fight between these two. Kimi has a brief look around the outside of the Red Bull but doesn't have a go this time. Räikkönen has much fresher tyres, five laps compared to Verstappen's 17 lap old supersofts. 5 second time penalty for Esteban Gutiérrez - ignoring blue flags. Räikkönen pulls alongside Verstappen in the DRS zone. Into turn two, Kimi clipped the back of the Red Bull and ran wide off track. There's some damage to the front wing of the Ferrari. Team radio from Kimi Räikkönen: "He moved right and then back to left as I was going there." Replays show it does look like Verstappen moved to the right as a defence, and then was heading left because that's where the corner went. Hard to call if that counts as a double move. That may have been the best opportunity for Kimi, as his tyres get older and he's now missing front wing. But he's still within a second of the Red Bull so he's not going to give up. Verstappen runs wide and gives the Ferrari an opportunity but Kimi makes his own mistake and loses the momentum. Ten laps left and Verstappen versus Räikkönen is the best fight on track at the moment. They're coming up on some traffic now. Out front, Hamilton has stretched the gap a little to 1.5 seconds now. Rosberg has a comfortable 14 seconds over third place Ricciardo. Team radio to Jenson Button: "Box this lap, box this lap. Back off, we're going to retire the car." As Kimi moves to within three tenths of Verstappen, the gap at the front has closed as well. Rosberg dipping in and out of DRS range at this point. Replays show Hamilton had a lock up and ran wide which has allowed Rosberg right into the fight. Button does head into the pit lane and the McLaren is retired. He's the only DNF of the race so far, and we've got just five laps to go. Tweet from @ManorRacing: Lap 63/70 | BUT retires, the only retirement of the race. We are P19 & P21, with ERI squished between us. Felipe Massa comes into the pit lane, at this very late stage in the race. Black and white flag for Romain Grosjean - track limits. Räikkönen went for a last ditch attempt on the Red Bull, but couldn't brake in time and ran wide. Remains behind. The other Ferrari of Sebastian Vettel is also hunting down a Red Bull, this time looking to take third place off Ricciardo. 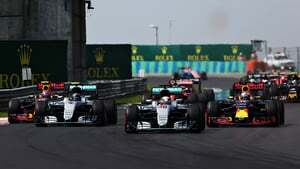 Lewis Hamilton wins the Hungarian Grand Prix! He moves into the lead of the championship, with Nico Rosberg settling for second place in the end. Daniel Ricciardo fends off Vettel to scoop another podium position, and Verstappen held off Räikkönen yet again for fifth. Hamilton exits the car in the pit lane and heads to the waiting mechanics for big hugs and back slapping from everyone involved. Rosberg follows afterwards. Daniel Ricciardo looks happy with his result, as he extricates himself from the Red Bull. Podium quotes - Lewis Hamilton: "Firstly, a bit thank you to all the fans here. They’ve been amazing this weekend. It’s because of these guys that this race is so spectacular… With the race, the start was everything. I got a good start, I had one of the Red Bulls on the inside of me, so I was pressured into turn one. The team did a great job with the strategy… A huge thank you to them, this is a great result for the team. What a day!" Podium quotes - Nico Rosberg: "It was all down to the start in the end, I lost out a little bit. Into turn one, with Daniel on the outside and Lewis on the inside, I ran out of space, had to bail out of it… From then on I was trying to put the pressure on Lewis, but it’s impossible to overtake on this track. The next race coming up very quickly, my home race, it’s going to be awesome." Podium quotes - Daniel Ricciardo: "It’s great to have another podium this year. Obviously the first one was a bit bittersweet but this one I can definitely enjoy. For sure, the smile is back. Super happy to be here today, three years in a row I’ve been on the podium at this track. It’s been good to me. Thanks to everyone, thanks to the team, we’re continually getting better." Turns out it wasn't the best race, it couldn't live up to the promise of qualifying. There was plenty going on but none of it resulted in any excitement. No drama at the first corner, no major strategy surprises, and no one able to overtake no matter how hard they tried. Good job by Lewis to move into the lead of the championship, great job by Alonso (who finished 7th again!) to pick up a point for McLaren. It seems likely that Verstappen will be voted driver of the day again, but impressed with Ricciardo's performance to pick up a quiet but well-needed podium. Otherwise, not much to say about the race. Roll on next week, where we'll have the final event before the summer break, with the German Grand Prix.